Quantum sensors; next-gen computer design; memristors. A new quantum sensor developed by Fraunhofer researchers will be able to measure the tiny magnetic fields of the next generation of hard discs, leveraging the new opportunities that quantum technology promises. 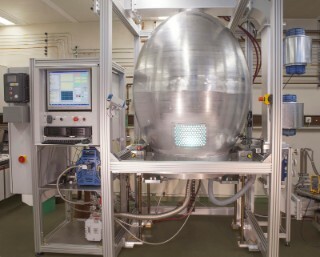 The special ellipsoid form of the plasma reactor developed at Fraunhofer IAF allows for large-scale diamond separation. Indeed, integrated circuitry is becoming increasingly complex. Take for example an Intel Pentium processor that contains some 30 million transistors. The magnetic structures found in hard drives measure just 10 to 20 nanometers across – less than a flu virus at 80 to 120 nanometers in diameter, Fraunhofer researchers reminded. Dimensions are rapidly approaching the realm of quantum physics and researchers at the Fraunhofer Institute for Applied Solid State Physics IAF in Freiburg, Germany are applying themselves to the quantum technology challenges of tomorrow. 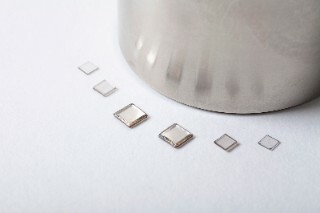 Ultra-pure diamonds produced at Fraunhofer IAF for quantum applications. Together with colleagues at the Max Planck Institute for Solid State Research, they are developing a quantum sensor that will be able to precisely measure the tiny magnetic fields expected for the next generation of hard discs. The sensor itself is just slightly larger than a nitrogen atom, with a synthetic diamond to act as a substrate, they reported. Diamond has a variety of advantages quite apart from its considerable mechanical and chemical stability including the ability to implant foreign atoms such as boron or phosphorus, thereby turning the crystals into semiconductors. Also, the team noted, diamond is the perfect material for optical circuits. And perhaps its greatest attribute is its impressive thermal conductivity, with the strength of the carbon atom bonds ensuring that heat is rapidly dissipated. Manufacturing the quantum sensor requires a particularly pure crystal, which has inspired further improvements in Fraunhofer’s process. For instance, in order to grow ultra-pure diamond layers, the methane that provides the carbon for the diamond is pre-filtered using a zirconium filter. On top of that, the gas must be isotopically pure, since only 12C – a stable isotope of the carbon atom – has zero nuclear spin, which is a prerequisite for the magnetic sensor later on. 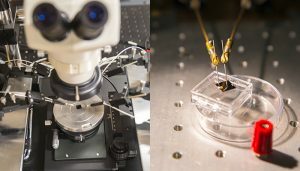 The researchers expect the tiny sensor to potentially be applied in a wide range of scenarios, since there are weak magnetic fields everywhere, even in the brain. As the computing industry struggles to maintain its historically rapid pace of innovation, a newly established $32 million center based at the University of Michigan aims to streamline and democratize the design and manufacturing of next-generation computing systems. Sounding a bit like the increasingly popular concept of chiplets, the Center for Applications Driving Architectures (ADA) aims to develop a transformative, plug-and-play ecosystem to encourage a flood of fresh ideas in computing frontiers such as autonomous control, robotics and machine-learning. Critics have been concerned that the industry is stagnating, caught between physical limits to the size of silicon transistors and the skyrocketing costs and complexity of system design. The center is a five-year, U-M led project that includes researchers from a total of seven universities, pending final contracts: Harvard University, MIT, Stanford University, Princeton University, University of Illinois and University of Washington. The ADA is funded by a consortium that is led by the Semiconductor Research Corporation and includes the Defense Advanced Research Projects Agency (DARPA), which has a separate chiplet project. The center is one of six new centers recently announced as part of the Joint University Microelectronics Program, organized by the Semiconductor Research Corporation. ADA said it aims to democratize the development and deployment of advanced computing systems by developing a modular approach to system hardware and software design, where applications’ internal algorithms are mapped to highly efficient and reusable accelerated hardware components. They said the faster and more effective approach will require that the entire design framework—from system software to architecture to design tools—be reimagined and rebuilt. The center is organized into three themes: agile system development, algorithms-driven architectures, and technology-driven systems. DARPA and the Semiconductor Research Corporation will contribute $27.5 million to this project, with the remaining funds provided by the participating institutions. The full extent of Internet of Things is coming, but much is still required including components and chips that can handle the explosion of data that comes with IoT, according to Aalto University. In 2020, there will already be 50 billion industrial internet sensors in place all around us, and a single autonomous device – a smart watch, a cleaning robot, or a driverless car – can produce gigabytes of data each day, whereas an airbus may have over 10,000 sensors in one wing alone. Before this happens, two hurdles need to be overcome. First, current transistors in computer chips must be miniaturized to the size of only few nanometers because they won’t work anymore then. Second, analyzing and storing unprecedented amounts of data will require equally huge amounts of energy. Aalto University Academy Fellow Sayani Majumdar, along with her colleagues, is designing technology to tackle both issues. Majumdar has designed and fabricated the basic building blocks of future components in what are called “neuromorphic” computers inspired by the human brain but so far no one has come up with a nano-scale hardware architecture that could be scaled to industrial manufacture and use. “The technology and design of neuromorphic computing is advancing more rapidly than its rival revolution, quantum computing. There is already wide speculation both in academia and company R&D about ways to inscribe heavy computing capabilities in the hardware of smart phones, tablets and laptops. The key is to achieve the extreme energy-efficiency of a biological brain and mimic the way neural networks process information through electric impulses,” Majumdar explained. In a recent article, Majumdar and her team show how they have fabricated a new breed of ferroelectric tunnel junctions, that is, few-nanometre-thick ferroelectric thin films sandwiched between two electrodes that have abilities beyond existing technologies and bode well for energy-efficient and stable neuromorphic computing. What makes ferroelectric thin film components great for neuromorphic computers is their ability to switch between not only binary states – 0 and 1 – but a large number of intermediate states as well. This allows them to memorize information not unlike the brain: to store it for a long time with minute amounts of energy and to retain the information they have once received – even after being switched off and on again. These memristors are ideal for computation similar to that in biological brains.